A3 - Music Theory Chart The ultimate resource to learn or review all aspects of harmony/music theory & chord building. 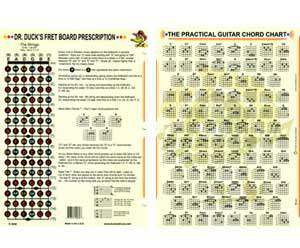 The ultimate collection of guitar chord diagrams of the most used guitar chords for Rock, Blues, Bluegrass, Pop and Country guitar on one side and "Dr.Ducks One Page Guitar Prescription" on the other - with the names of each note on the guitar fretboard filled in all the way up to the 15th. fret. A4 - double sided - Nashville number system, Chord building & Harmony, Music Theory Chart. Lefty Left Handed Chord Book. Written and printed in Australia.